Sorry for the slight hiatus, everyone. I’ve been a little distracted recently but I’ve really missed blogging. Somehow I’ve fallen into learning bits of programming after work/reading (i’m reading a book written by a former undercover FBI agent who infiltrated the American mafia! )/stoning in front of the computer. I know. No excuses. So here we go: what I whipped up for tonight’s dinner in 40 minutes. Mmmmmm I do love steak! Partly because it’s so easy – coarse sea salt and ground black pepper on each side, stick it on a hot pan, leave it to brown on each side before turning (approx 4 minutes on each side), done. No recipe needed for that, surely. And for the sides – a quick soy sauce, mirin (Japanese sweet rice wine), and oyster sauce stir-fry with broccoli and mushrooms, and a cheesy penne. I improvised on the penne because there was some leftover cheddar in the fridge, and was really pleased with the results. I had it in my mind to go for a ‘mac and cheese’ kind of taste, so I simply melted butter, cheddar cheese, and milk into the pot of hot, freshly cooked penne with some of the remaining hot water used to boil the pasta. Turned out to be a nice American-ish meal (if hunks of red meat, fatty carbs and Chinese stir-fries can be associated with the US of A), very appropriate for watching the presidential election results coverage! Oh how I miss the US. Living in England is great (anyone else see some good fireworks shows over the weekend/on Monday night for Guy Fawkes? ), but have to say that the food here is at times quite dire. Or perhaps I’m just all pub-ed out (I count probably 4 pub meals in the past two weeks – not good for the wallet… …). You know that awful feeling when your throat is sore and your face is so congested you can’t breathe properly through your nose? Well that feeling hit me on Monday evening, and I knew straight away that I wouldn’t be fit for work the next day. I’ve been at home for two days now as I literally couldn’t do anything but sleep, make myself simple meals, and check e-mail and WordPress. Hoping that I’ll get well enough to be able to go into work tomorrow and to London on Friday for a training course on digital editing, which I’ve been looking forward to for awhile. However I’m not one to sit around feeling sorry for myself, and one of the good things about being ill is the comfort food. For comfort food, we often turn to our roots to the foods that we grew up with, so today I’d like to share two quintessentially Cantonese dishes that Hong Kongers love eating: steamed fish, and congee. So healthy and fresh. Credits to WS for cooking this for me. I do suspect that he might be the better cook! *This is just how I steam food but you can use any trivet or steamer basket within a large lidded pot/wok for the fish. 1. Heat wok with water on high heat to bring water to boil. Set bamboo lattice inside the wok. You will use this lattice to rest the plate containing the fish, so that the water below the lattice gently steams it without touching the actual plate. 2. Put the fillets of fish on a rimmed plate, skin side up. 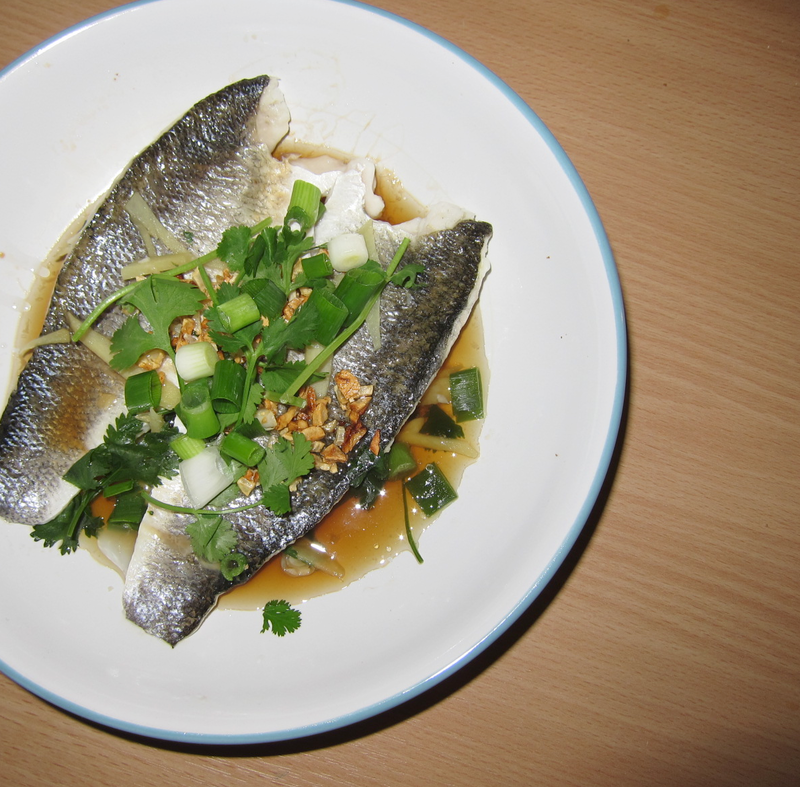 Scatter the ginger and half of the chopped spring onions on the fish, pushing some of it gently into the fish. 3. Drizzle a tiny bit (no more than half a teaspoon) of oil over the fish. Drizzle a little bit of soy sauce and a bit of salt. 4. Place the plate containing the fish onto the bamboo lattice. Cover the wok with a lid. Lower the heat to low heat, or just enough so that the water steams so gently you can’t hear the lid bubbling up. The gentler the steam, the better the fish will taste. This is crucial. 5. Steam for 12-15 minutes, until fish is cooked through. 6. Remove plate, bamboo lattice, and water from the wok. Turn up heat to low-medium heat. 7. Heat wok with a bit of oil, and fry the minced garlic and remaining spring onions for 2 minutes. 8. Add the garlic to the fish. Garnish with fresh coriander leaves. Add a few drops of sesame oil. Serve hot! Congee (say ‘juk’ for the Cantonese name) is another popular kind of breakfast/lunch food in Hong Kong. It is basically a savoury rice porridge cooked to a creamy consistency, almost to the texture of apple sauce. We usually eat it cooked with various ingredients, the most popular being preserved egg and shredded pork. Also, for some reason Hong Kongers like peanuts in their congee too, something which I’m not so crazy about — I have a slight aversion to peanuts (a story for another time). I grew up eating congee with my paternal grandmother; in fact, I don’t remember eating much else apart from congee and pickled vegetables when I lived with her for a time. I believe she ate congee almost every day, often while watching black and white Cantonese and Teochew opera shows on TV in her tiny flat in North Point, Hong Kong. Sorry I’m getting sidetracked here by nostalgia — my paternal grandmother is no longer with us but my memories of her are deep. She was an incredibly strong and resilient woman: a single mother and silk-worm factory worker, and a reserved but loving grandmother. Anyway, I’ve listed below my own basic recipe that uses dried scallops to lend the congee a seafood-y flavour without overpowering the delicate flavour of ginger and scallions. Yum! *There’s no need to be exact here, but a general rule of thumb is the uncooked rice to water ratio should be about 1:10. 1. Add rice grains, water, ginger, and dried scallop to a stainless steel pot. Bring water to boil. 2. When water starts to boil, cover, turn down heat to low, and let mixture simmer for at least 45 minutes. Check on it occasionally and add more water if you see that the congee is drying up. 3. In a separate small pot, hard boil the eggs for 10 minutes on medium-high heat. Drain water carefully, and de-shell eggs. 4. 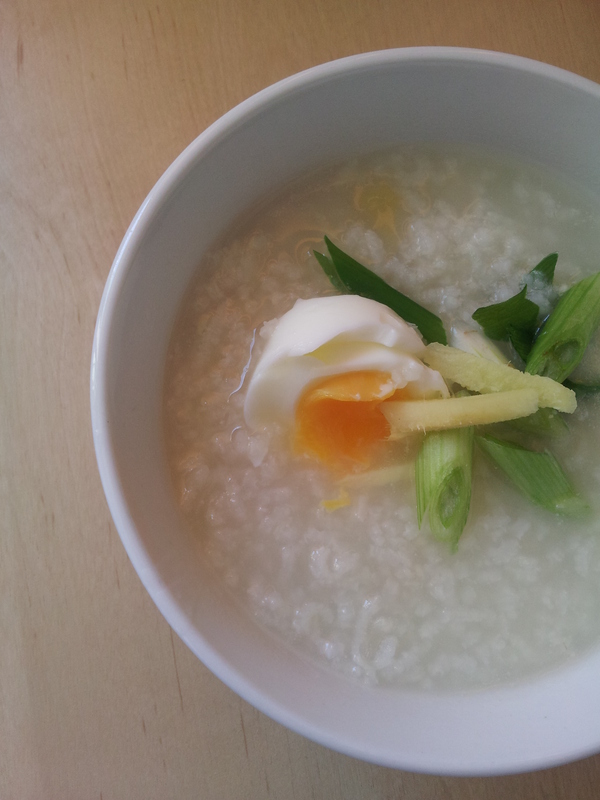 When congee has reached a creamy consistency, switch off heat and add in eggs. 5. Garnish with extra spring onions. Season to personal taste.